Children do not cool down as efficiently as adults, so it is important that they drink lots of water. Taking a few simple precautions will help protect children and allow them to enjoy a safe and fun summer! 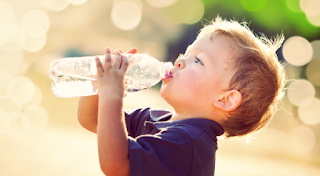 Preventing Dehydration – How frequently should children drink fluids? How much is enough? The best way to prevent dehydration is to make sure children drink plenty of water at all times. They should consume more fluids than they lose. During continuous physical activity, a child can lose up to a half-liter of fluid per hour. The American Academy of Pediatrics (AAP) suggests that an 88-pound child should drink about five ounces (or two kid-size gulps) of water every 20 minutes as well. Children and teens weighing about 132 pounds should drink nine ounces of water. Drinking extra water before organized sports or other strenuous activities is highly recommended. Schedule beverage breaks every 20 minutes during any physical activity, especially in hot weather. If possible, take all hydration breaks in a shady spot. Pack frozen water bottles in a cooler to keep other bottles of water cool. When choosing drinks for kids, avoid soda and other drinks that have caffeine, which contributes to water loss in the body. Again, water is the preferred choice for hydration. Sports drinks should be limited to athletic competitions to replace electrolytes. If your young child refuses to drink water, offer a high water content fruit such as watermelon or a frozen treat such as popsicles. Remember that thirst is not a good early sign of dehydration. By the time a child feels thirsty, he or she may already be dehydrated. Good hydration habits are as important as good eating habits. Encouraging frequent beverage breaks and choosing liquids wisely will help protect against dehydration.